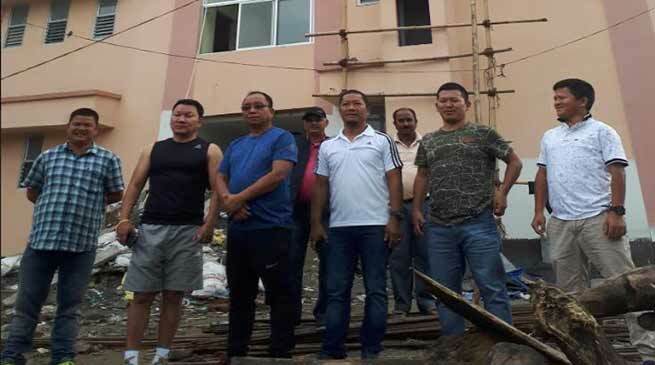 Parliamentary Secretary PWD, UD and ULB and local MLA Techi Kaso today take stock of the on going construction of the Mini Secretariat building here alongwith the officials of the PWD Naharlagun division and contractor. Kaso while inspecting the building directed the officials to check the quality of the work done properly as per specification. Kaso informed that the work is being done and as it is being monitored by the officials, we hope that the work could be completed before the time period as local administration is working from other building and this building will cater to accommodate more offices in it. He said that it would be our endeavour that the building is constructed for a specific purpose and would be served a bigger purpose as the Additional Deputy Commissioner will be function from here alongwith other officials and other department would be adjusted in the huge building. Naharalgun PWD Division Executive Techi Nobo while informed that the mini secretariat which would serve many purpose of the capital district administration. and it would be ready by July 1st for inauguration. The building being constructed at an estimated cost of twenty crore having all provision of modern facility like lift with provision of safety measures.